Pregnant? How to organise a nursery in 9 months! 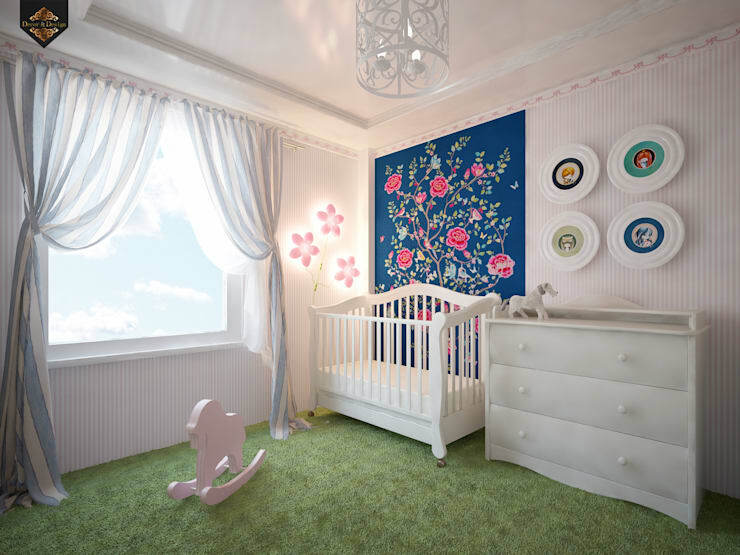 Aside from the actual birth of your child, one of the most exciting times before your baby is born is designing the nursery. Preparing and styling the room can also help you learn about the child, and get ready to become parents. As well as being a wonderfully fun experience, nursery designing can often seem an intimidating undertaking. You don't want to forget anything, nor do you want to do anything wrong. Luckily homify is here to help! 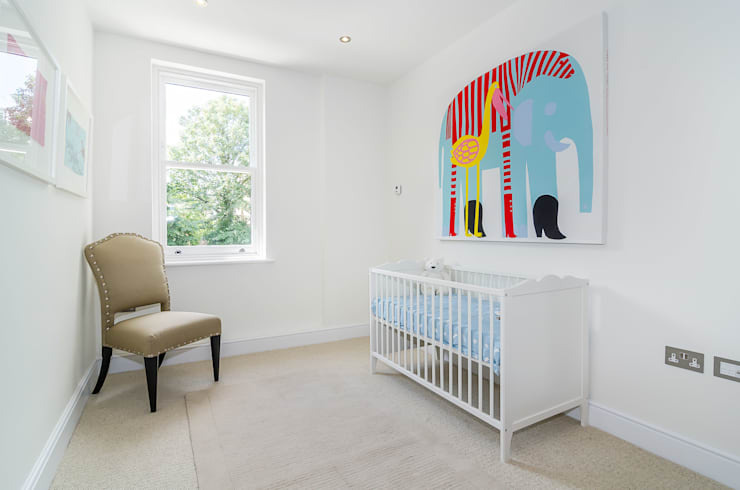 Getting a nursery ready is more often than not one of the most important things on the minds of the parents, and there are a number of things to consider. Storage, furniture, colour palette, and toys are common essentials, as well as overhauling the room to feel welcoming and stylish. 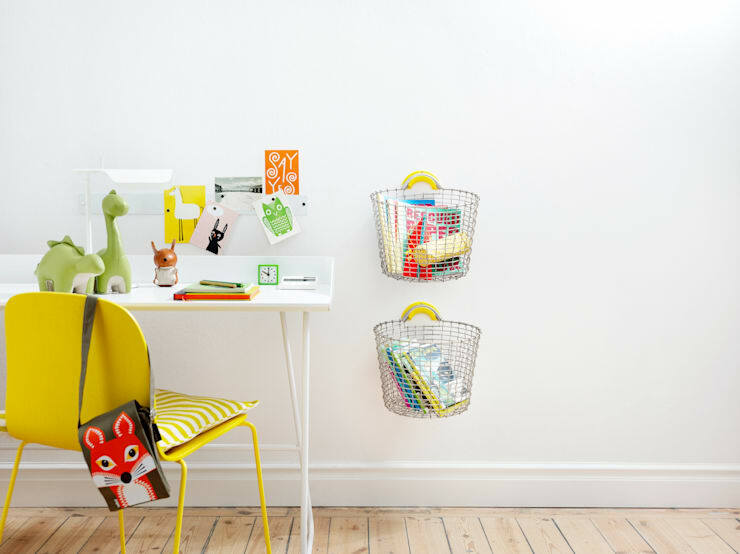 If you've cleared out the home office to make room for a nursery, you will want to transform it from a workspace into a comfy and colourful child's room. To get a head start, and to guarantee you have a room ready in 9 months, check out the following steps below, and ensure you have your nursery ready to go before your little bundle of joy arrives! Decoration can really make or break a nursery. Firstly you will want to ensure you follow a simple theme. Choose a colour scheme, and stick to it! If you are considering a bright and lively child's room, perhaps think outside the box and invest in some bright and energetic art prints. This example is a great illustration of how to brighten a neutral space with a wild and wonderful print. The room is simple and serene, but gives the child something exciting to look at while they are going to bed. 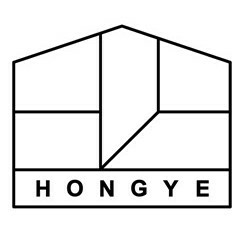 The shapes are abstract and evoke a sense of creativity. This can also be a good alternative to a mobile hung above the cot. Remember to ensure the print is well secured to the wall, as there is always a risk of it falling and injuring the child if it is installed poorly. 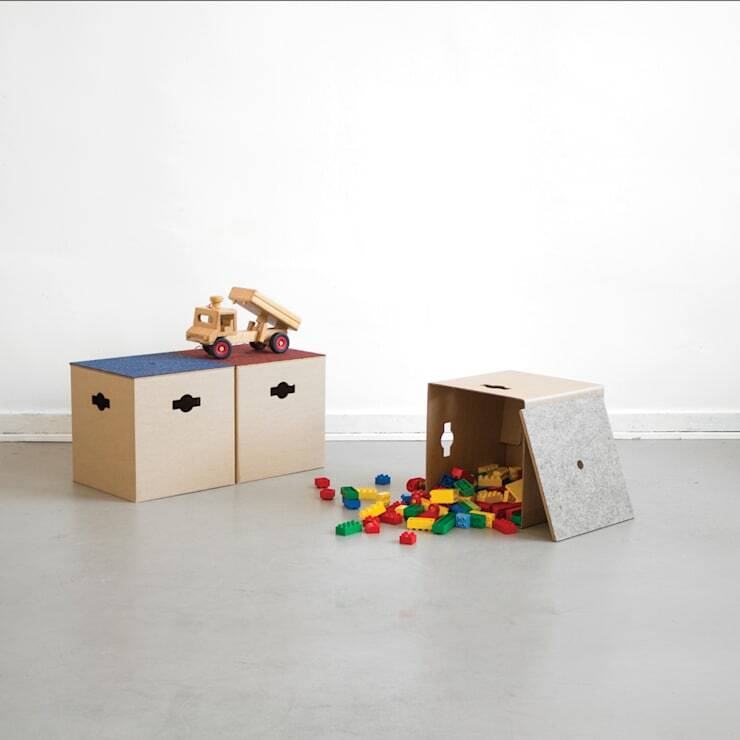 Small storage is essential for a practical and useful nursery. As well as offering a stylish wall feature, these hanging baskets from Korbo, are a wonderful demonstration of stylish organisation. These mesh buckets have their roots in history, and have been used for centuries by farmers and fishermen as a practical holder for produce. Timeless in their design, these are ideal for holding books, toys, or other items that you may use often, and therefore want easy access to. As well as hanging conveniently upon the wall, these pieces will also age with your child, offering a convenient way to train them to clean up after themselves with a handy and easy accessory. Probably the most important purchase you will make for your child, the cot is the centre of your new nursery. This is the item that your little one will sleep within, rest, and often play, and therefore you will want to ensure it is a comfortable, timeless, and practical design. The cot or cradle is the number one item that will be used from the moment your baby is born, and should reflect a sense of comfort, security, and easiness. These days there are numerous designs and styles on the market, and it can be tricky knowing where to begin. Firstly you will want to choose between a cot or a cradle. What's the difference you ask? Well, a cradle is the larger bed with sides, seen in the example here, while a cradle is a smaller, often oval shaped bed with lower sides. A cot is practical, and will suit your baby for longer than a cradle, but can be large and cold for a tiny newborn. A cradle is often chosen as an interim piece of furniture for the first couple of months, as it is easier to keep warm, and a baby can feel more secure within it. Along with the style you choose, be it modern, contemporary, traditional, or eclectic, you will have a plethora of other options to consider. Teething rails, drop down sides, and mattress choices are the most common things you will be asked. When choosing your cot, ensure you purchase an item that has the correct safety specifications, and adheres to the strict guidelines set by the country you are in. For this reason, you may want to be extra thorough when purchasing a second-hand bed, as these may not be known. Even before they are born, babies tend to have a rather extensive wardrobe of clothes! You will find you are setting up your nursery long before the baby is due, and because of this you will need a place to store all of those bits and bobs. Playsuits, nappies, jackets, booties, and bibs are only the beginning of all of the items you will acquire, and therefore you will require a place to store these goods. 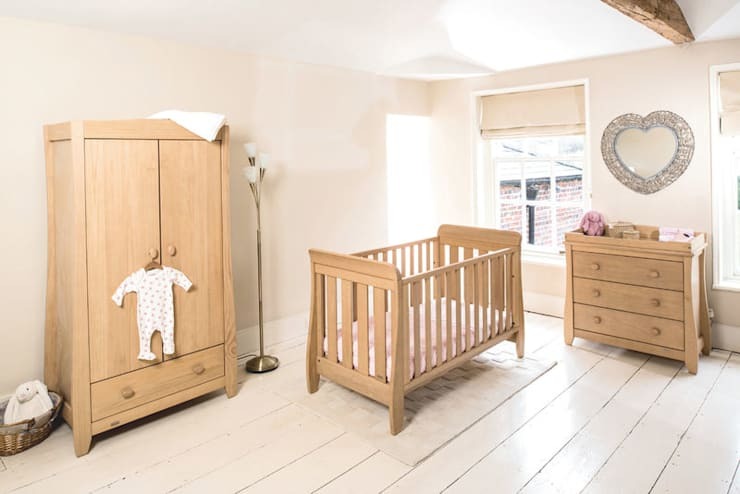 Although it may seem silly to install a large wardrobe into a nursery, this will actually prove to be a solid investment in the long run. Children grow up before your very eyes, and you will notice how quickly they turn into a little toddler, and then a small child in an instant! Consider installing a wardrobe that will provide much needed storage in the early years, but can transition into a practical robe for the many years to come. Dressing windows is one of the most important things to consider for your new nursery. Often seen as a luxury item, and not a necessity, curtains, drapes, or blinds actually help to create a theme within a room, soften the décor, and add style to the space. Not simply a good looking accessory, curtains and blinds actually insulate the room from drafts, and keep the space far warmer than a curtain-free space. Perhaps not surprisingly, your baby will most likely acquire a less than desirable sleeping pattern, and although this will change over time, there will be moments when your little one needs to get some shut eye in the peak sunshine hours of the day. Ensure you provide a dark and comfortable environment for slumber with thick curtains that can be closed, keeping out the sunlight. Furthermore, if you have employed sheer curtains, add a blind to block out any light during the day. One final thing to note: if you are using heavy curtains in a bedroom remember to regularly vacuum and clean them, as they are a trap for dust that can lead to respiratory problems in babies. Toys are essential, and likely some of the first things you will purchase for your baby. Choose safety-regulated items that are accredited for babies, and always check the age limit when buying. It is a good idea to store these accessories somewhere within the nursery, and consider purchasing a set of drawers to hold all of the knick-knacks. Moreover, while your baby is too small to play with them, they can be used as colourful decoration instead. One final thing to consider when getting your nursery ready is the wall colour. The colour of the room will impact hugely on the overall aesthetic of the space, and it is for this reason you will want to choose something peaceful, serene, and tranquil. 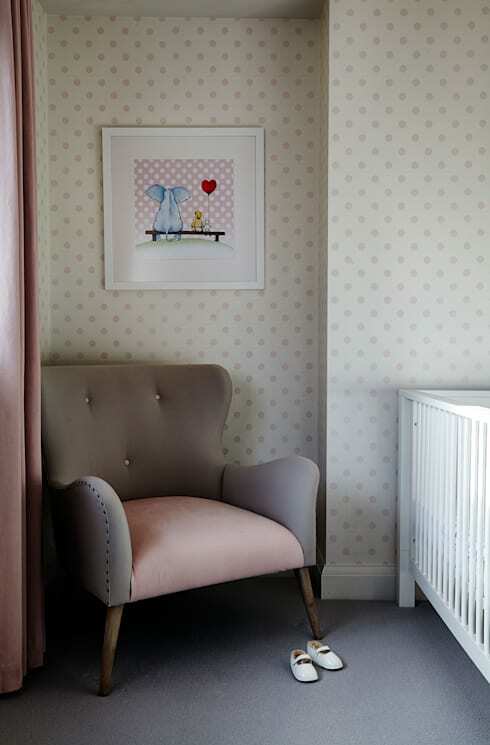 This example presents gorgeous wallpaper that utilises a soft pink polka dot with a cream background. The nursing chair next to the bed is designed in the same tones, and imparts a truly gorgeous ambience and atmosphere. To inject a little life and energy into the space, art prints are framed and hung upon the wall. Do you have any tips or tricks for expectant parents? We'd love to hear from you in the comments below!